Experience Park Lane, an urban eco-oasis... 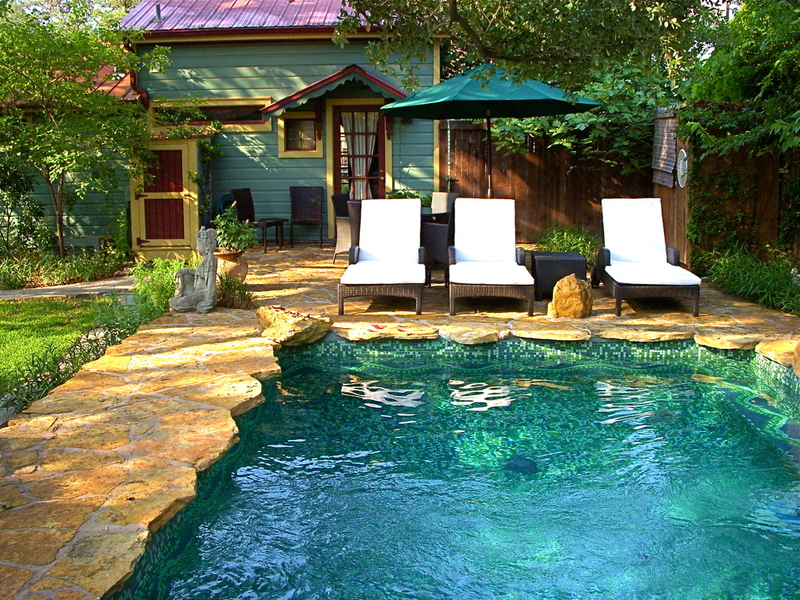 Located in the heart of Austin, Texas's historic SoCo district, two blocks from South Congress Avenue, and walking distance to downtown, our unique Guest House offers elegantly appointed private cottages. Relax beside our natural pool in the shade of the live oak tree, and enjoy the Park Lane's organic vegetarian breakfast in the comfort of your cottage or on your private deck. Our bed and breakfast is conveniently located to the Texas State Capital, the Austin Convention Center, Lady Bird Lake hike and bike trails and the University of Texas. Park Lane offers free parking, free Electric Vehicle charging, and is just a short walk to convenient bus routes or you can even rent one of our guest bikes. We are located less than 2 miles from beautiful Zilker Park and the Soul of Austin, Barton Springs Pool. Relax in our eco-oasis. Sleep in privacy and comfort in one of our uniquely designed cottages. Enjoy our mosaic glass tiled swimming pool, outdoor shower, organic gardens, and onsite massage therapy. Recharge in the comfort and privacy of your solar powered cottage and sleep in organic comfort. Enjoy complimentary fair trade coffee, tea and filtered water. Chemical cleaners are never used and your bath amenities are all organic and cruelty free. Parking and electric vehicle charging is complimentary for all guests. Indulge yourself each morning with a freshly prepared organic vegetarian or vegan breakfast. Fresh eggs from our free range hens, fruits and vegetables from our organic garden and many locally-sourced ingredients. Breakfast is served on your private deck, by the pool, or in the main house dining room. Enjoy our urban oasis and be delighted by the feeling of being in a sanctuary in the middle of the city. Park Lane Guest House is so close to all that Austin has to offer. We are located just 2 blocks from the vibrant South Congress (SoCo) district ,featuring shops ,restaurants and live music venues and ½ mile from downtown. Walk or rent a bicycle on site to enjoy Austin like a local.